I have put together three experimental works for tomorrows presentations today. They are all unresolved to different extents, however I feel they demonstrate my progress in terms of how to consider the possibilities of interactive artworks. The light model that Stuart Childs and I have been collaborating on has turned out well, and demonstrates the idea of controlling things outside a building from within. 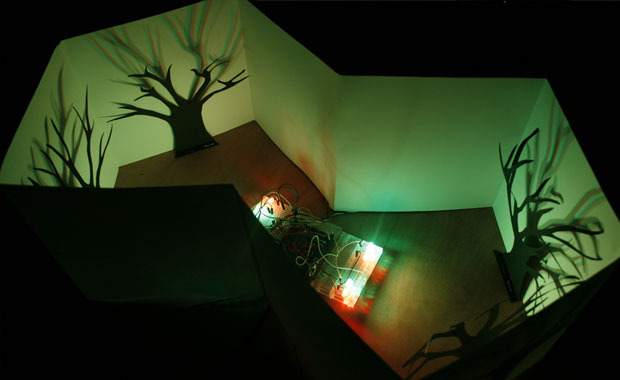 The sensors on the outside of the structure represent touch screens, and when touched they illuminate the LED lights in the centre; which then light up the tree silhouettes and project their shadows on to the paper structure. I feel the eye work that I have entitled ‘Poke’ is the most resolved piece I have developed on the residency, and I would like this to be part of the exhibition next week. I have also being experimenting with the bird idea I mentioned in my last post. 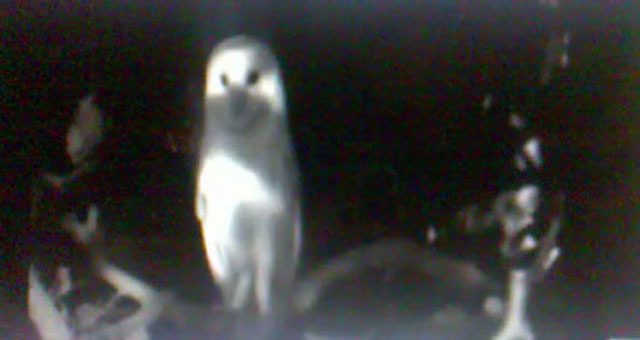 I took some found footage of an owl to try out the processing code. Although it’s not a resolved idea it can be developed in the future and rigged up to a door, so that when someone walks in to the room the bird captured flys away as if disturbed.